The last humans fled a dying Earth 300 years ago, but there was something they couldn't leave behind: the Legacy Code. Every colonist in the fleet carries mangled genes that damage the unborn, and half of all pregnancies must be terminated. "If you like dystopian novels, I would recommend this one for you "
"I felt like I was there. The romance was sweet, there was pulse-pounding action, the friendship between the girls was amazing, and I was rooting for the characters so hard." "A couple of chapters in and I was already hooked I ended up staying up till midnight (as a mother of a toddler this is a rare occasion) in order to finish it. I'm Looking forward to seeing what is in store for the colonists." "It kind of had an initial feel of Battlestar Galactica -- a civilization that has to abandon their planet and go in search of a new one. ...It had mystery, a bit of a thriller-like aspect, humour, and a taste of romance. I'm hooked enough for another taste, now I just have to wait "
"OH MY GOODNESS I just finished this book...at 6:00 AM. This society crafted by Autumn Kalquist is fascinating. I can't even imagine how much time she spent carefully plotting every detail. Their existence feels so real and so frighteningly possible." "I both love and hate this book ... but in a good way Instantly I fell in love with the characters and storyline that Kalquist spun together. ... This story is based in the future (almost a space opera / dystopian) where the populations of earth escaped to space to find a better world. ...we arrive in a distant future where civilization exists on space ships and they have to take decades before making jumps across space - similar in a way to what I imagine Stargate..."
"It pulled me in faster than most books I have read and kept me on the edge of my seat through the end. I read it all in just a few hours." "I started reading Legacy Code and within the first few pages I was hooked ...it is brilliantly written with detail and imagination from the offset, It is also really well edited. 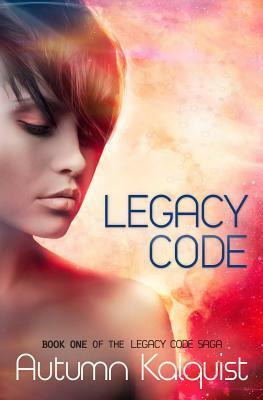 I am really looking forward to where the next installment of the Legacy Code Saga is going to take me." "Autumn Kalquist is a talented author. LEGACY CODE is easy to read, her plot is engaging, and her characters are real. Her world building is second to none, and I felt completely sucked into her story." "Upon receiving my copy of The Legacy Code, I started reading and just could not stop, until it was over." "I found this an enjoyable read as a Young Adult sci-fi story. The situation was interesting: a fleet of spaceships jumping through wormholes in search of a new habitable planet, after people on Earth has royally screwed things up, including the human genome. A young couple expecting a baby had to undergo a genetic test to determine if their unborn baby has "the defect," which would require it to be aborted. This being only the first book of a series, the story is relatively short, and I was left wanting more, which is a sign that the author has captured me, the reader, successfully. Just when you start getting attached to the main characters...STUFF HAPPENS. And you MUST know what happens NEXT." "(source: Legacy Code reviews on Goodreads.com)"